The guy may have a point. 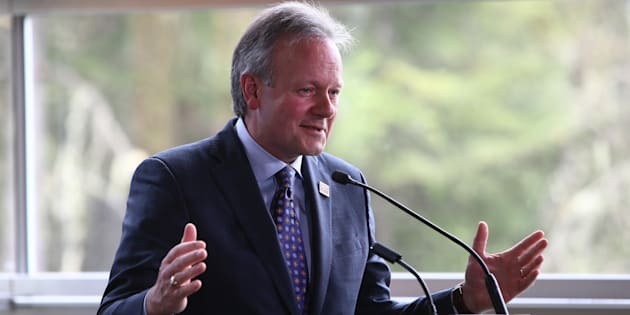 Stephen Poloz, governor of the Bank of Canada, at the G7 Finance Ministers and Central Bank Governors meeting in Whistler, B.C., May 31, 2018. The governor of the Bank of Canada, Stephen Poloz, had some advice this week for Canadians facing higher housing costs thanks to the Bank's interest rate hike: Just buy a smaller house. "People who don't qualify for a mortgage on the house they wish today have multiple avenues of adjustment," Poloz said during a press conference announcing the rate hike, "one of them being to just go ahead to buy a smaller or less expensive home." One (perhaps cynical) way to view his comments is: You're on your own. The Bank of Canada isn't going to stop hiking rates to save you money on your mortgage payments. But while Poloz's comments may come off as insensitive — especially to would-be homebuyers who watched affordability deteriorate as the Bank tripled its key lending rate over the past year, to 1.5 per cent from 0.5 per cent — there may some wisdom in what he says. Because we Canadians sure occupy a lot of space. According to a PricewaterhouseCoopers (PwC) report from 2017, Canadians own, on average, the third-largest homes in the world, behind only Australians and Americans. At nearly 2,000 square feet, our homes are more than twice as large as homes in Britain, despite the fact that our families are no larger than theirs. It's estimated that the average home size in Canada doubled from the 1970s to 2000, though that trend has levelled off, largely thanks to high land costs in Toronto and Vancouver, which have pushed developers to build smaller homes (as have land use regulations requiring more dense neighbourhoods). Excessively large homes are a liability, economically and to the environment. Heating a 2,000-square-foot home in winter, then air conditioning it in summer, makes for very high energy use and a large carbon footprint. And the explosion of sprawling suburban neighbourhoods has eaten up much of the accessible land around our city centres. Developers today, especially in Toronto and Vancouver, say one reason house prices are so high is that land supply is so low. In retrospect, it may not have been such a good idea to surround our cities with low-density, low-population neighbourhoods. Today, those neighbourhoods are increasingly occupied by aging empty-nesters, often single seniors living alone in giant homes. Even in rapidly-growing cities like Toronto, suburban neighbourhoods are actually shrinking in population. All this points to the need for better land use, especially if — as is the plan — Canada's population continues to grow rapidly through immigration. Housing affordability eroded to its worst level in nearly three decades in Canada in the first half of this year. Market theory tells us the best way to reduce home prices is to increase supply. With the increasingly limited space we have, smaller housing units are a practical solution. Poloz's rate hike doesn't help buyers much, but if it does nudge buyers away from the McMansion lifestyle, we may all be better off in the long run.